Update: The name of this article ends with “They’re here to stay” – but we were wrong. As of March of 2019, it appears that Trustify is no longer in business. We’re leaving this article up until Trustify is shut down for sure, just in case, but from what we can tell, the company is no longer active. Trustify, a D.C. based startup that offers on demand investigative assignments in small and affordable blocks of time, has been around for the majority of 2015 and has been making some serious noise within the PI Community. When I first heard of Trustify, it was called FlimFlam – same service and company, different name – I was against it. I didn’t agree with the practice, and honestly felt that Trustify was going to damage our industry. I had a really tough time wrapping my head around the system, how it worked, and how they got around particular state laws. I had 10 different inquiries about Trustify from June 1 to July 1 – and every single time I referred them to Brian Willingham’s article: The “Uberization” of Private Investigators. The more people asked about the system, the more I felt I had to get some firsthand experience with Trustify. (My business is to offer solutions for my clients, not refer them out to Brian’s blog). Finally, after reading a post on the Private Security & Investigations Group on Facebook, I bit the bullet: If I’m going to talk the talk, I’ve got to walk the walk. Disclaimer: If you are a representative of Trustify and would like to offer a rebuttal to any of the points listed below, feel free to message me via ruben@investigatormarketing.com – I’m not going to change the article since this article was written with our clients in mind, but we can add your opinions directly below each of my statements. I was always under the impression that Trustify handled the entire assignment from start to finish and we [investigators] worked the investigation as a subcontractor to a national PI company. As it turns out, Trustify is more in line with a referral network similar to PI Now, Angie’s List, or Thumbtack. When I received my assignments, I was the one who called the client, I setup the investigation, I worked out the details, and I worked out future surveillance dates and times – the only thing Trustify did was marketing, acquired the leads, took the financial risks, and sent out my payment. I spoke with Mike H., director of investigations for Trustify, who told me that if a client doesn’t pay for the surveillance, I was still going to be paid by Trustify. So while I’m not making $70+ per hour, I can rest easy knowing that I’m going to get paid regardless of the outcome. Personally, I think $30 per hour is a bit low, but I didn’t have to do anything for the cases. I’ve been a silent investigator for about 2 years now and I received 3 cases over a weekend without having to do anything to attract those leads. A couple of our clients actually use Trustify to keep their investigators busy during slow months. Their investigators are paid salary whether there is work or not. Rather than having them sit at home collecting a free paycheck, they use Trustify to keep their investigators moving and bringing some sort of revenue into the company. Not enough to tip the bank, but enough to make sure they’re breaking even at the end of the month. Investigator contact information: This is the information they will use to get hold of you for your cases. And possibly send you checks? The information is relatively basic, so I’m not sure as to why they need this one. Send in your resume: Here is where they break down how long you’ve been in business, what your primary strengths are, and it offers you a way to “sell” yourself to the team at Trustify. Submit Licensing Proof: Take a picture of your DL and PI Licenses and submit it to them. 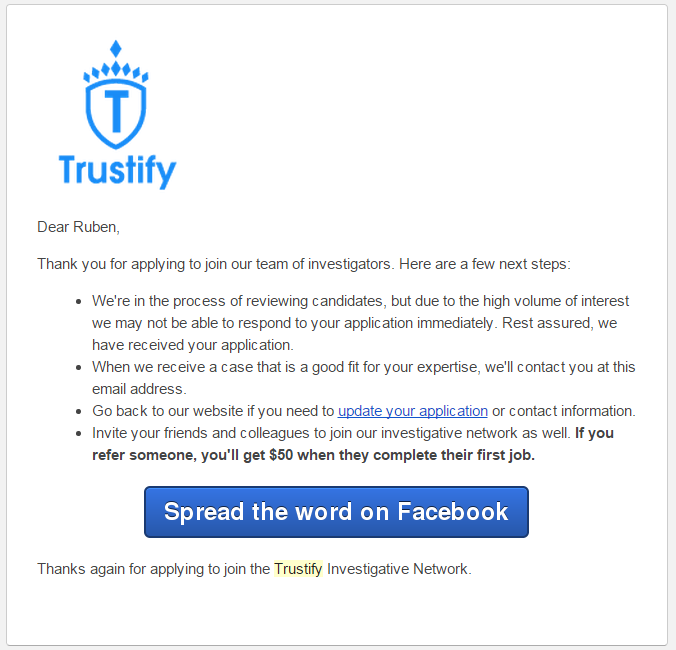 I applied to Trustify on Thursday, July 23. After the application was submitted, they sent me an e-mail outlining what was going to happen next. I have a relatively extensive PI career, so getting accepted wasn’t a problem on my end. I also made sure to offer them as much information as possible. I didn’t want them to question anything that could jeopardize my getting on board. Next day – Friday, July 24 – I received a call from a Trustify representative that went over several different guidelines, explained to me who they were, and asked me to elaborate on my experience. I noticed my LinkedIn profile started to pick up some views from people in DC; I figured they were doing their research into who I was. The interview took about 30 minutes and I was told that my information was going to be passed down to Mike H. – Trustify’s Director of Investigations. On July 27 , I received a call from Mike. We went through several additional questions where he really drilled down my experience. Personally, I think the questioning was a bit overboard, but I understand why he was doing it. Not to mention the fact that he probably figured out I owned Investigator Marketing and wanted to make sure I wasn’t trying to scam the system. The interview feels like a job interview – where do you come from, why did you leave, where did you go, etc. He verified my licensing with the state, verified my insurance, and made sure things were up and running. Shortly after I got off the phone with him, I received a welcome to the Trustify network e-mail. The Trustify Guidelines are pretty straight forward. They cover Case Assignment, Starting & Working a Case, Updates, Completing a Case, and Getting Paid. Ultimately, they want you to be good to the client. When they first e-mail you the guidelines, they attach a tracking code to the URL. I assume this is to ensure that investigators actually read the guidelines. I’m not sure if it affects whether or not you get cases, but I wouldn’t be surprised if it does. I replied back immediately requesting additional information on three of the cases near my area. They replied back with the Client Name, Phone Number, Desired Outcome, and Details. They also added a description of the target and basic personal information about that target. I’m not adding the e-mail here because of the sensitive information. I was given instructions to contact the client at the given phone number and offer a free consultation. If they wished to meet in person, I was told by Trustify that we could invoice for the time. One of the 3 cases was a flop. The client decided that she wanted to wait until a later date. The other two cases went flawlessly. I spoke with my case manager, J. , and asked him if they screened their clients. According to J., several case managers work day in and out to screen all the cases that come through the system. They verify the case is legitimate, they try to figure out if the case is going to be legal in the state that the investigation is being requested in, and they make sure the client is not trying to harm the subject of the investigation. Once they’re done with their screening process, Trustify e-mails the information to the investigators where the client goes through a second round of screening. If at any time the investigator feels, detects, or decides that the investigation is high risk, dangerous, or illegal, the investigation is terminated. I gave this client a call and got the information I needed. I told him the surveillance would be for 4 hours. I got the approval from the client and sent the information to my Trustify agent. They charged his credit card, and I setup my calendar. That same weekend in the morning hours, I followed my client around town while he was in custody of his child. I obtained video to show the court that his child did not “ fear ” him. I processed the video and sent out the video link to the client and to a Trustify Agent. I texted the client that our investigation was now complete, and he replied back with a simple “ Thank You. ” I took a screen shot of the text which I then forwarded to my Trustify agent and the investigation was wrapped up. I contacted the client on a Friday afternoon and he returned the call Saturday morning. It was a possible infidelity case. I suggested 8 hours of surveillance over a weekend. He agreed. I sent the information to my Trustify agent; they charged his card and I setup the calendar. That same weekend at night, after I finished with Client #1, I went out to the assigned location for my second client. I contacted my client and he replied back with a photo of his spouse. I was able to identify the Subject and surveillance was conducted for a total of 6 hours from 7:00 pm to 1:00 am. Sadly, during this time, we did gather enough evidence to suggest the spouse was cheating on our client. We again processed the video once we got home and sent out a text message, for which the client thanked us. We sent the text message screenshot to our Trustify agent and the investigation was wrapped up. Trustify is a bit cumbersome at the moment, I really wish they’d fix their communication system in the near future. Because clients communicate with the investigators all the time, this means that the investigator is the one who has to communicate/relay the information to and from Trustify. Unlike working for a national PI firm which uses a dedicated case manager, we have to contact the client directly and treat them like a client of ours; but let them know where you got their information. “My name is Ruben I’m a licensed investigator here in Texas, I received your information from Mike over at Trustify. I was assigned the case to work with you and solve your issue”. So rather than Trustify handling all the work, we are the ones who do everything from A to Z – we have to also keep Trustify In the loop. No complaints here. I do wish they paid out more than $30 per hour, but at the end of the day, I made $300 on a Saturday that was filled with pre-scheduled TV re-runs on Netflix. I opted to have my payments sent to me via Direct deposit. August 19, I had my money in the bank. Since that day, I’ve had several different cases come through the system, but I honestly don’t have the time to handle them or I would. The cases are extremely easy; most are quick in and out cases and don’t require much work. I agree 100% with this concern, but the fact of the matter is that we’re working as subcontractors for another company that is selling their service at $70+ per hour. The only way that Trustify could hurt our industry was if they were undercutting our services and selling investigations at $30 per hour. If that were the case, then yes, our industry would be hurt and our services would be devalued. But advertising competitive rates to their clients means that we can compete against Trustify – assuming we can attract the client base. 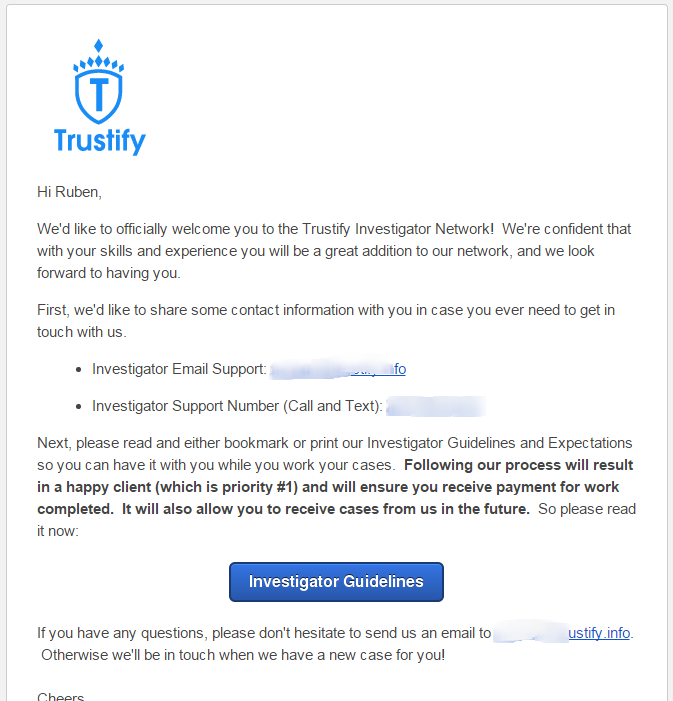 Trustify receives an e-mail from a client. Trustify puts their client and the investigator in contact with each other. Investigator works out investigation specifics directly the client. Investigator lets Trustify know what the client needs and begins the investigation. Investigator turns in all evidence to the client and tells Trustify that the investigation is complete. Trustify pays the investigator for the investigation. Trustify takes all the risk of getting paid and deals directly with the client after the investigation is finished. To my understanding, Trustify doesn’t have to be licensed in the state since all they’re doing is sending leads to the investigators. According to a College Professor at a local University, “If they needed to have a license to send out referrals, it would be illegal for anyone to refer private investigators to each other”. Not to mention, according to Mike H. They’re working with every state’s regulatory board and have been working within the states’ laws. I was in direct contact with the client and handled the investigation entirely by myself. I updated my Trustify contact regarding the investigation and they handled the rest. I told the client, “this is what happened and here is the proof.” I told Trustify, “This is what I told the client and here is my proof.” Trustify then closed off the case, sent me my money, and the case was done. This is an argument that can go both ways. When I was actively subcontracting cases and taking subcontracting cases for my PI agency, we averaged $30-40 per hour as an “investigative privilege” and we paid $30-40 hours for the same reason. The split was always 55/45 (I kept 55% of the income for sending out the lead and taking on the risk, the investigator kept 45% for doing the work and not having to worry about the client afterwards). Trustify’s payment structure is just about the same. They charge $70 per hour and pay out $30 per hour (at least that was the case with me). With that being said, however, I like to think that my experience, work results, and knowledge is worth more than a novice investigator. Likewise, the experience of a 30 year veteran is worth more than mine. So this is something that they have to work on for sure. From my understanding, Trustify screens all of their clients individually prior to sending out the case to an investigator. Once it makes it to us, we have to screen the clients and make sure they are legitimate, the investigation will be ethical, the investigation holds merit, and we’re not going to shoot ourselves in the foot. I didn’t run background checks on the two cases since everything added up on my end. I’m not sure if Trustify would allow you to charge for a background check on the client, I wish I had asked when I was working the assignments, but that’s definitely something to ask about if you do any cases for them in the future. This is something that I really have a problem with. In South Texas, $30 per hour can go a long way. In New York, Miami or San Francisco, $30 per hour is not even going to cover the cost of gas. I wish that Trustify implemented a sort of percentage payment structure or gave investigators the ability to negotiate prices with the client to make more money per hour. If that’s not possible, they should at least have set minimums based on the areas of the US where the investigator is located. Again, I agree 100%. It would very nice if Trustify had a way to charge their clients for the experience of an investigator. If Trustify is really trying to become the Uber of Private Investigators, I feel they should offer Uber style services to their clients. A 2 door Chevy Cobalt is cheaper than a 4 door Bentley. Likewise, a 5 year seasoned investigator is going to be more affordable than a 30 year veteran with specialized certifications. If you’re afraid of not getting paid – Trustify pays you directly and they collect on the payment from their client at a later time. If you don’t want to market your services – Trustify actively markets their services 24/7 and attracts the leads which get sent down to investigators on the field. For me, this is a pretty good proposition. I am an active licensed investigator in Texas, but I rarely do any work now since I’m focusing on website design and SEO. Even when I did work on a regular basis, I never attracted as much work as Trustify is doing in my area. So far, I’ve seen 15 different cases (In 3 weeks). If I had the time and manpower to do it, Trustify could very easily keep my lights on. I feel like we [Investigators] have to understand that Trustify is here to stay. When instant background checks and databases came into the picture they changed the way we looked at background checks. Trustify is disrupting the way the Investigations Industry works, and I highly doubt that anyone is going to have a say in whether or not they can stay. They’re targeting the major population through very aggressive marketing techniques and have the budget and funding to back them up. Anyone can replicate what Trustify is doing through advertising, but it’s not easy. With that being said, you have to remember that Trustify is not going to make you rich. I think Trustify should be used as extra residual income. I did it as an experiment on a weekend that I had open and ended up making $300 – so if you’re asking for my honest opinion, sign up with Trustify, give it a shot yourself but take it for what it is – a referral network for private investigators.